Creationist Ken Ham has taken aim at atheists who have criticized his views on the origins of creation by arguing that they are trying to impose their "anti-God religion" on children, an accusation he also threw at famous astrophysicist Neil deGrasse Tyson. Ham wrote on his Facebook page that his recent Tweet criticizing the "Cosmos" TV series as imposing atheism on students made "secularists get overly emotional over their religion." He pointed to responses to his argument on blog sites, with titles such as "Ken Ham is a Liar," "Creationist Ken Ham Fears New Cosmos Series Will Create Pandemic of Reason and Critical Thinking," "Ken Ham Disparages Schools Showing Cosmos in Class for 'Imposing Atheism on Students,'" and then went on to defend his position, saying that Tyson, who worked on the show, "basically tells students to worship the sun/the stars." "Our ancestors worshipped the sun. They were far from foolish. It makes good sense to revere the sun and stars because we are their children. The silicon in the rocks, the oxygen in the air, the carbon in our DNA, the iron in our skyscrapers, the silver in our jewelry — were all made in stars, billions of years ago. Our planet, our society, and we ourselves are stardust." Hemant Mehta of The Friendly Atheist blog wrote that "Cosmos" does not try to indoctrinate children into anything. "Cosmos is a secular series in the sense that it doesn't impose anything on its viewers except a love of science and an understanding of how we came to know about the mysteries of the universe," Mehta said in a blog post. "Ham, who teaches children that the world is 6,000 years old and evolution is a hoax, is the only one imposing nonsense on people too young to ask critical questions," he added. Ham, who leads Answers in Genesis, the Creation Museum, and the upcoming Ark Encounter attraction in Kentucky, insisted in his Facebook post that for too long secularists "have been allowed to impose their anti-God religion of evolution/millions of years on generations of kids — and we are seeing the consequences in an increasingly secularized culture and large numbers of young people drifting from the church." AiG blasted "Cosmos" as soon as it premiered back in 2014, serving as a relaunch of the 1980s series by Carl Sagan. While AiG's Dr. Elizabeth Mitchell argued back then that "Cosmos" attempts to "package unconditional blind faith in evolution as scientific literacy in an effort to create interest in science," Tyson explained that the goal of the show is to "convey why science matters to the person, to our society, to us as shepherds of this planet." 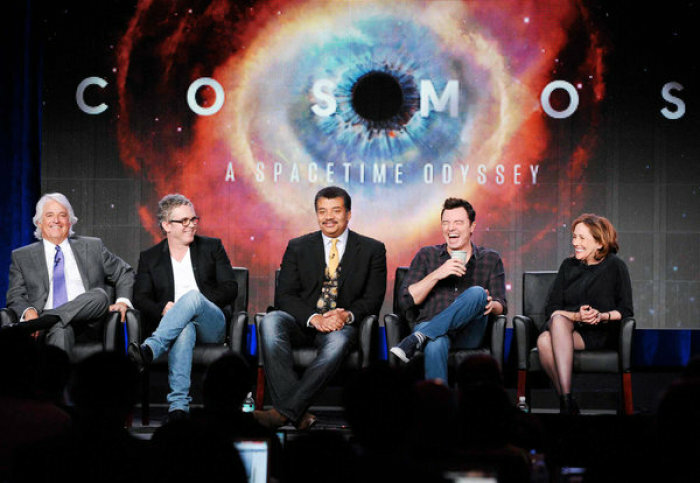 "It involves presenting science in ways that connect to you, so 'Cosmos' can influence you not only intellectually but emotionally, with a celebration of wonder and awe," Tyson added.